Take a Livonia Party Bus from Party Bus Detroit! If you're going out for a night on the town in Livonia make sure to take a party bus from Party Bus Detroit. The Livonia police have been cracking down on Michigan DUI arrests and if you take a party bus you won't have to worry about driving. You can also legally drink on the bus as long as you're 21 since Party Bus Detroit is licensed by the state of Michigan as a bus carrier, has the proper insurance for high passenger capacity buses, and only hires CDL drivers with a passenger endorsement. 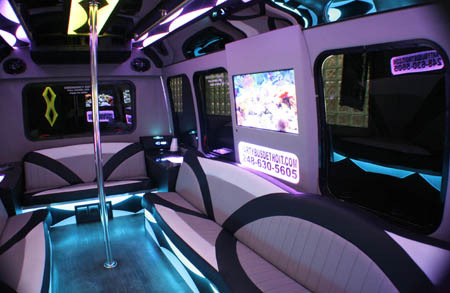 Party Bus Detroit has high quality vehicles with all of the features you want. There are several unique vehicles to choose from. Each bus has LED or fiber optic lighting to give a party ambiance. Each bus has a built in cooler in the bar which will be stocked with ice so you can bring your drinks to keep them cold. Unfortunately they do not supply any alcoholic beverages because of michigan state laws. The party buses all have custom leather seating and wood flooring. Be sure to call Party Bus Detroit today for a Detroit Party Bus. They have not only the nicest vehicles and the most competitive pricing around but they also have the best service. They are open 24/7 and can provide service when ever you may need it. Give them a call now to book your vehicle because things somtimes get booked up months in advance. The bus above is our 22 passenger party bus with multiple TV's, color changing lights, and a loud sound system to name a few features. 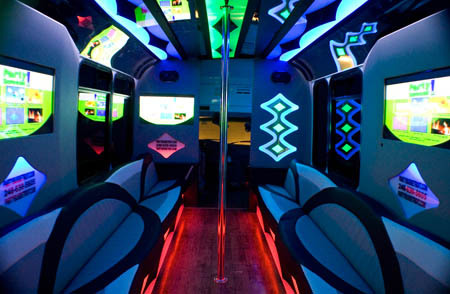 This is our 24 passenger party bus with a chrome dance pole, TV monitors, leather seats, wood floors, and more. This bus also holds 24 passengers and has similar features. This is our black 30 passenger party bus with a limo style interior. This bus is our pink 24 passenger party bus with four flat screen TV's and all of the rest of features you could possibly need. This bus has a limo bus interior with modern features.